After steam traction phased out on Indian Railways around 25 years back, it is the first time that a time-tabled weekly commercial steam train service has commenced at normal fair of Rs. 10/- between Garhi Harsaru and Farukhnagar section of Northern Railway this morning today i.e. on 23.09.2018, the Sunday. To fulfil the long standing demand of the public to have a train service on sunday, Sh. Ashwani Lohani Chairman Railway Board during his visit to Farukhnagar had announced it on 15th September 2018, the day ‘Swachhta Hi Sewa’ Pakhwara (Mission Clean India) had commenced. It is envisaged that the tourists and steam enthusiasts from all over the world shall visit these places for a ride on steam engine hauled train, increasing tourism related activities in the region. Presently, the train is being hauled by “WP7200 AZAD”, a broad gauge 1947, “M/s. Baldwin Locomotive Works U.S.A.” make. It was brought to India in 1947, the year of independence and hence named “AZAD”. The locomotive has been restored to its pristine beauty and mechanical engineering perfections. Its revival has been carried out at Heritage Steam Shed, Rewari of Northern Railway, stated Sh. Arun Arora Principal Chief Mechanical Engineer/N.Rly in keeping with the thrust of Shri Piyush Goyal, Minister For Railways & Coal in reviving steam tourism and preserving railway heritage. 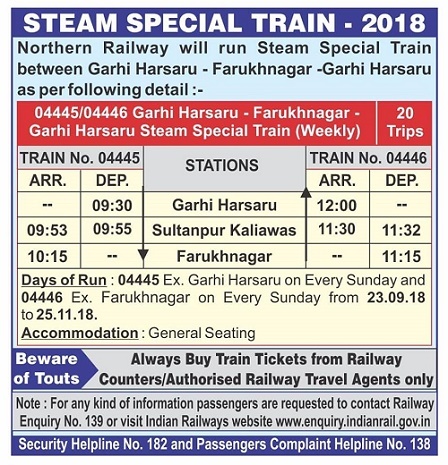 The 04445 Garhi Harsaru- Farrukhnagar Steam Special departs from Garhi Harsaru at 9:30 hrs to reach Farrukh Nagar at 10:15 hrs. While in its return service i.e. the 04446 Farrukh Nagar- Garhi Harsaru Steam Special departs from Farrukh Nsgar at 11:15 hrs to reach Garhi Harsaru at 12:00 noon. This steam Special has the stoppage at Sultanpur Kaliawas Halt in both directions. It is a great day in the history of Indian Railways that Heritage is being preserved and its display and ride is now open to public at a normal fare of Rs. 10/- only.